← Fighting Parkinson’s, and your mind, your heart…and your attitude! Reality is here. Reality is what is happening right here, right now. How you perceive reality is a choice. As daunting as this may seem, I am asking you to face reality and make this choice: If you are doing the Parkinson’s Recipe for Recovery®, then choose to accept that you are doing great! When somebody asks you, “How are you doing?” please do not run down a mental evaluation of your symptoms that day to determine how to answer the question and then give them a rundown of how badly your symptoms are that day. You are not your symptoms. This probably needs repeating: YOU ARE NOT YOUR SYMPTOMS! Each of you: “I am doing GREAT!!! If you are doing the Parkinson’s Recipe for Recovery® then you are curing yourself from Parkinson’s Disease no matter what your symptoms look like that day, so “I am doing great!” is a truthful answer. Get our of your mind and into your heart. For a refresher on that point, please click here. Think about it. 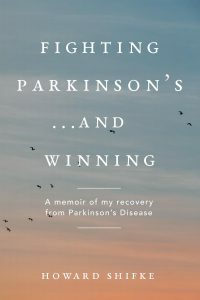 Parkinson’s is considered a progressively degenerative disease from which there is no cure, and by doing the Recipe you are curing yourself no matter what the others think…the reality in this moment is that you are doing great! You need to know this. If you judge yourself by your symptoms, and then tell others how bad you think your symptoms are, they will judge you by your symptoms, agree with how bad you are, and then tell you all of the things other than the Recipe that you should be doing to “improve the quality of your life.” Of course, this would take you completely off of the path to your recovery. Is this what you want? I didn’t think so. Instead, know in your heart that since you are doing the Recipe, you are curing yourself. It is the truth, so choose it as your reality. That should give you something to smile about, and it literally changes the face of Parkinson’s, one smiling face at a time. And with that big smile on your face, give them a resounding, “I am doing great!” At that point, people will not notice your symptoms because your face and your answer will speak 1000 words about your symptoms — your symptoms do not define who you are. Your symptoms are nothing more than a notification that you have more work to do to bring your soul, mind, and body back into balance and be cured. Click here to read more about bringing your life back into balance. If you want people to stop bothering you to “do the things that you do not want to do” about your Parkinson’s, then you need to take the first giant leap of faith, choose your perception of your reality, and stop defining your life through your symptoms. Put a smile on your face and know in your heart that you are curing yourself from Parkinson’s. That should make you feel great. And then, truthfully and fearlessly answer the question “How are you doing?” with a huge a smile and a resounding, “I am doing great!” The reality is, yes you are…you are doing great!!! Okay, everybody, put big smiles on your faces and chant together so the whole world can hear. Thank you Howard. It’s great to be supported by you as it can be so easy to succumb to negativity. Your reminders are priceless and truly appreciated. Thank you for a wonderful way to respond to people who want to know how I am. Yes, and how nice of you to ask~I’M DOING GREAT!! AND HOW NICE OF YOU TO ASK. So thank you for a good morning start as I go out into the world and MAKE IT A GOOD DAY! How infectious can I be with such a positive attitude toward every person I greet? I am doing great ! Thanks so much for asking! Have a wonderful day! Howard, you are a genius! Running down a list of symptoms in my mind is exactly what I do when someone wants to know how I’m doing! : my adrenaline fueled brain always striving to be correct , honest, and thorough. Thank-you, friend. Simply put, you are a God-send! Thanks for your message today, and thanks for asking how I am doing. I am doing great! I hope that everyone else is doing great and that all of you have a wonderful day! Feeling the LOVE guys! I’m so delighted that everyone is doing great, as I am DOING GREAT too. Have not skipped a day this week, so body is very challenged BUT feeling soooooooooo positive as I know it’s a sign that I am shifting blockages NOT getting worse. Howard, my friend, two posts in one week, feeling very spoilt and nurtured as usual by you. I feel a part of a very special group of people on here, an awesome community of comarardarie and support. God in motion Howard, God in motion. I am so appreciative of Howard and all of you. I’m working with a TCM doctor who is helping me, some symptoms already way diminished but it’s knowing that you all are fighting on that supports me emotionally, you are all so valuable, a big thank you, and I’m doing great too ! So glad to hear you are all doing great! So am I! Think of you all alot! Thank you all. I am doing great too! I am so glad to hear that you are all doing great! part of a group of positive like minded people. Sally and I are doing great, too! Thank you for asking. We are so pleased to see that you are doing great, and we are abundantly grateful for your love and kind words, and that you are able to look inside yourselves and see how GREAT all of you are! AND…that you are opening your hearts to each other and supporting yourselves and each other in our world-wide recovery community. Thank you, thank you, thank you. Have a beautiful weekend! Hi! I AM DOING GREAT TOO!!!! I’m doing great, as well. Seems when I closely attend to the breath and embrace this present moment in the qigong flow, the limiting egoic-minded stories dissolve and the light of divine greatness reveals as the ONENESS that we are. Thank you, Howard, for your inspiration that is so well expressed in your ongoing support.